The next evening was a freezing night so we opted to stay at eat the Mirage where we are staying. 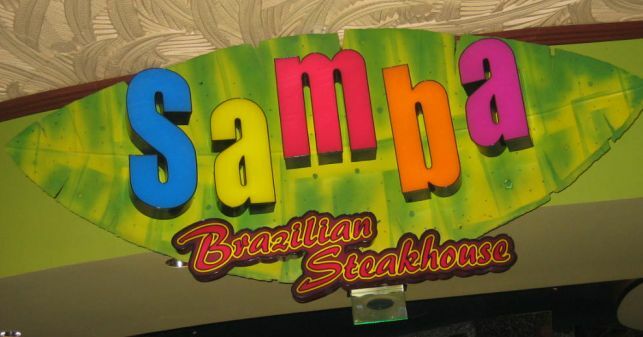 I decided to try out the Samba Brazilian steakhouse located on the 1st floor of the Mirage casino. 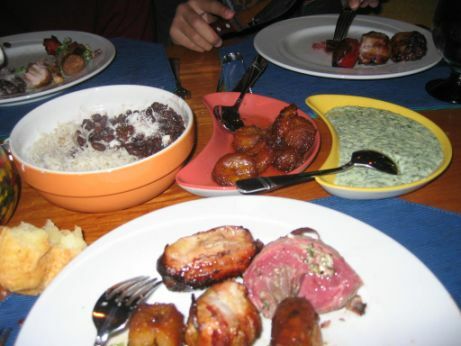 This is a very popular Brazilian-style barbecue offering unlimited portions of marinated meats, poultry, and seafood.. You got to love meat to eat there. Big colorful sign to welcome the guests. We had reservation at 7:00PM and this is just at the entrance of the restaurant. 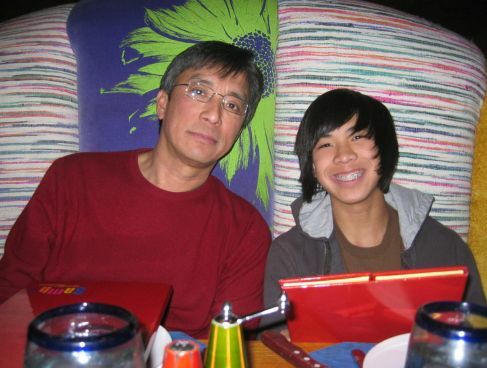 Hoa and Kevin glanced at the menu and decided to go with the all you can eat Rodizio Experience. 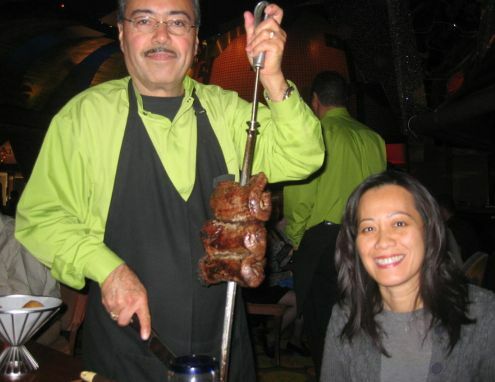 Rodizio is the ultimate all you can eat barbecue, offering unlimited portions of marinated meats, poultry, and seafood. 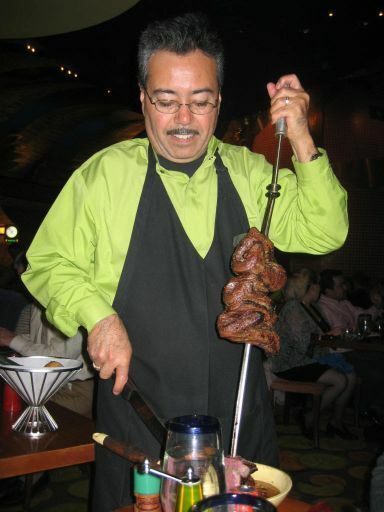 Rodizio is a uniquely Brazilian style of barbecue offering a wide variety of flavors. 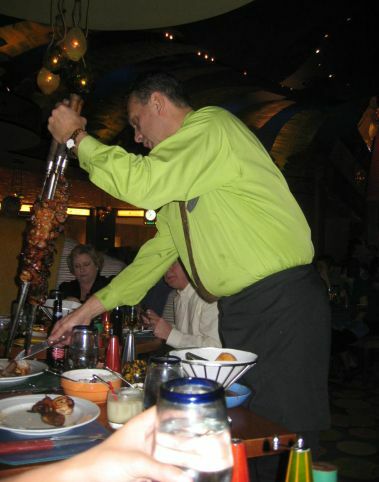 Each course is skewered and slowly roasted over coals in a special Brazilian rotisserie. 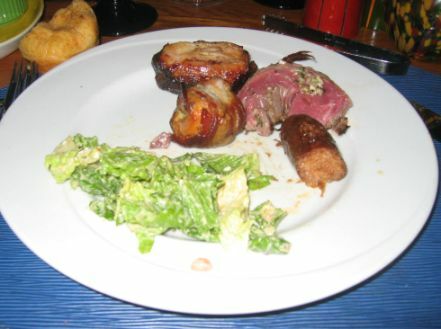 Basically, a bunch of servers stop by our table with a variety of skewer of meats. They keep serving you until you tell them to stop. There is a little wooden block painted half in green and half in Red. If you display your block with the green side, it means that you would like to be served more meat. If you are displaying your block with the red side it means that you are done with the food so the servers do not come around anymore. 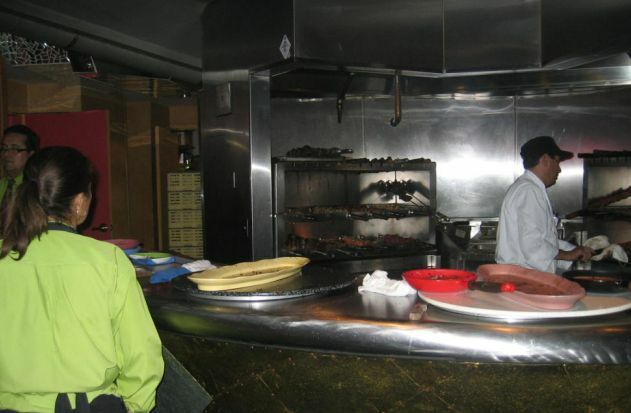 The meats are served with traditional side dishes of black beans and rice, sweet fried plantains, creamed spinach, carrots, and a bowl of “Samba Salad” tossed. Here is the samba salad. It tasted just like a Caesar salad. Basically the all you can eat menu consist of: Slow cooked Sausage and Sweet Peppers. Honey Brushed Turkey Breast Roulade Wrapped in Bacon, Huli Huli Chicken Hawaiian Style, Churrasco Sirloin “Picanha” Style, Brazilian Style Baby Back Pork Ribs, “Alho” Style Chicken Legs, Ginger Soy Flank Steak, Slow Roasted Pork and Pineapple. The servers kept coming but we were so full by the time we tried a little bit of everything. View of the kitchen from our table. 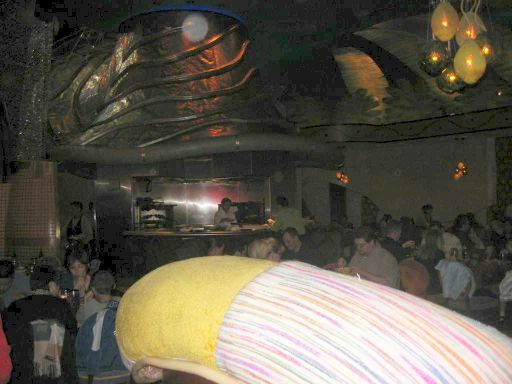 The place was totally booked and there was a long line of people waiting to be seated. I am glad I made reservation to be here. Close look at the kitchen! lots of meats are coming out of the Rodizio. 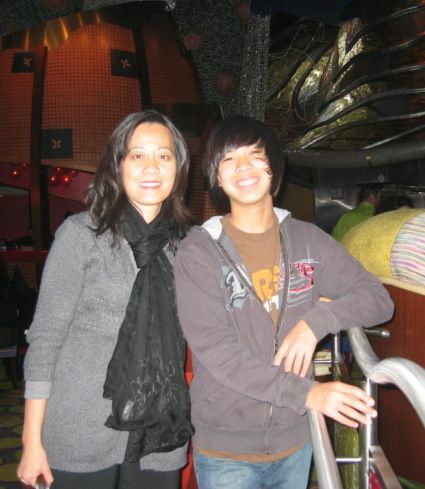 Overall it was fun to eat there!